Are Drones Obama's Legacy In War On Terrorism? One privilege — or burden — of the Oval Office is that each inhabitant gets to decide how dirty to get his hands in wartime. Although the CIA program is classified, published accounts say President Obama has decided to take personal responsibility for making decisions about whom drones will target and kill. Are Drones Obama's Legacy In War On Terrorism? The Obama administration's use of drones to kill suspected terrorists in foreign countries may be President Obama's biggest legacy in the fight against terrorism. One privilege — or burden — of the Oval Office is that each inhabitant gets to decide how dirty to get his hands in wartime. President Truman made the ultimate decision to use the atomic bomb, while President Kennedy chose not to use a nuclear weapon in the Cuban Missile Crisis. "I think every head of government will make the decision as to who will or will not exercise targeting authority," says Gary Solis of Georgetown University, an expert in the law of war. Although the CIA program is still classified, many published accounts say Obama has decided to take personal responsibility for making decisions about whom drones will target and kill. The president leaves lots of other targeting decisions to people far below him in the chain of command. He doesn't decide which artillery battery will target which village in Afghanistan, for example. 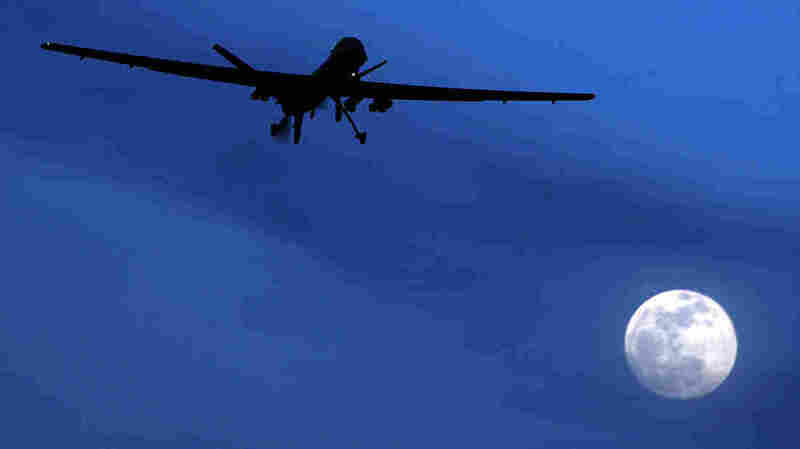 Drones target individuals, and they fly into countries where they may not be welcome. Solis says they pose thorny new legal and moral questions such as, "Where is the battlefield? Can we fly these individual aircraft into Pakistan [or] Yemen? Where can we take these planes and kill people?" The rules for drone wars are still being written. The Bush White House spent eight years writing and revising the rules for a new kind of war against al-Qaida and other terrorist groups. It created novel detention and interrogation policies. Obama pretty much washed his hands of those policies. But on drones, Harvard Law professor Jack Goldsmith says, this president took the baton and ran with it. "Because the capacity and technology of the drones improved, and the political and legal costs of detention became very high," Goldsmith says. Goldsmith, a Bush Justice Department official, says Democrats would have attacked Bush for these decisions. With a few exceptions, they're giving Obama a pass. Goldsmith, who wrote Power and Constraint: The Accountable Presidency after 9/11, says he isn't surprised. "Yet Obama is not getting a total pass on drone strikes," he says. "There's a symmetry there because President Obama gets a pass when he does things kind of out of character against the expectations we had when he came to office. "President Bush got a pass when he wanted to do things like try terrorists in civilian courts ... when he released prisoners from [Guantanamo Bay] and when he tried to do softer things," he says. The ACLU's Jameel Jaffer is part of a lawsuit challenging the secrecy surrounding the drone program. He says the president has created a bureaucratized killing program that "will be available to every future president against every future enemy or purported enemy." That might not be a widely held view in the U.S., but overseas there is a growing consensus that Obama's drone policies are controversial at best. The man who took office promising to restore America's standing abroad has seen that standing wane recently, thanks in part to the use of drones. Ken Anderson, a law professor at American University, says he thinks this is an extension of a longstanding trend. "The trend of the U.S. military and U.S. uses of force since at least 1990 ... [is to] find more discriminating ways of projecting force," he says. "It can't just be bigger and bigger kinetic explosions; you've got to find more discriminating ways to do it." Smaller and more efficient drone aircraft could put even more power in the hands of a wide array of countries in the future. So as the technology gets smaller, the legal and moral questions might only get bigger.